"Only 10 percent of all large fish—both open ocean species including tuna, swordfish, marlin and the large groundfish such as cod, halibut, skates and flounder—are left in the sea", according to research published in today's issue of the scientific journal Nature. That has not really left much for our kids has it. The problem is that as hunters of fish humans are getting too good. We started off a few thousand years ago with a fish hook, and with a bit of luck you would get something nice for tea. Nowadays we have sonar guided fishing ships that spend months at sea, with nets so large they can catch whole shoals of fish in one go. Able to carry a staggering 3000 tons of tuna, the Albatun Tres is the largest tuna fishing vessel in the world, it fishes using a purse seine net (image right) to catch up to 150 tonnes of tuna in one scoop. Skippers may aim to catch only sustainable tuna varieties such as skip jack, but with a net this big. . they catch allsorts of tuna. When water closer to home are fished out, the fishing boats further afield to catch tuna where they have not already damaged the stocks. Trawlers use a giant weighted net to indiscriminately scoop up all sorts of sea life from the bed of the seas around the UK. In many places this can be a frequent as once a fortnight, although more often it is around twice a year. With such frequent disturbances, sea creatures and as well as sea weed, and other flora, keep get cut back before they can establish themselves. 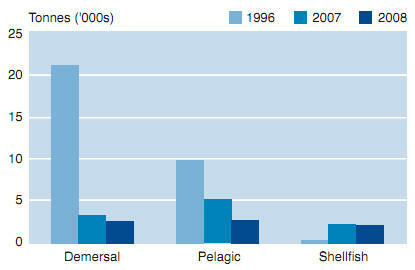 In 1956, the British trawling fleet brought in 8.36 million tones of fish, in 2007 this has dropped to 600,000 tonnes. So something is very wrong. . .wouldn't you agree? that is not under threat. Visit the Marine Conservation Society website, and download their list of species to avoid. the fishing method used to catch a fish has a big effect on the sustainability. Using a net catches everything fish, jelly fish, dolphins, turtles. . . . .
"27 million tonnes of dead and dying creatures, snared as unwanted bycatch, being thrown back into the oceans"
Try and buy line caught fish this is caught using a much more selective method of fishing. there will be thing written on the label like dolphin friendly, well that doesn't really mean anything. Two labels to look for are the MSC Eco Label and the MCS Label, both of which are certified scheme to check that producers are doing what they claim. Sign up to something that supports sustainable fishing, example to the left. 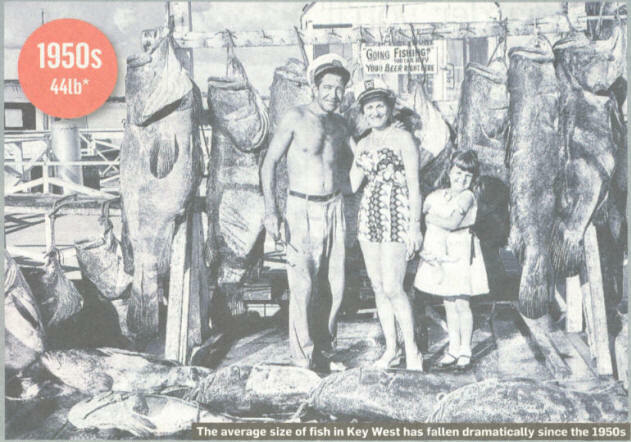 In the 1950s research conducted at Aberdeen's Marine Research Laboratories showed that the mess size of nets, if increased could greatly reduce the impact of trawler fishing. 10cm ( 4 inches) was the size deemed to be most effective where juvenile fish slip through the net unharmed, hopefully going on the bread and maintain fish stocks. At present however, net size is unregulated and fisherman choose which size to use. Erm . . . no. Unfortunately Salmon eat fish, and these are caught just like all the other fish, with big nets, they are then ground up, made in to pellets and fed to the farmed salmon. This problem is multiplied by the fact that for ever 1kg of farmed salmon that is grown, it has to be fed around 5kg of other fish, which has been caught from the oceans / sea. 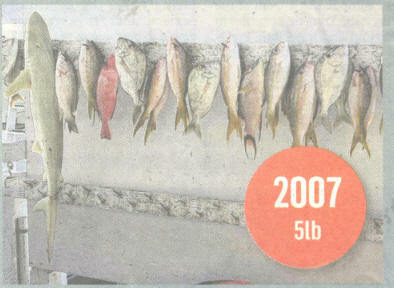 The same principal applies with most farmed fish and seafood, tuna are fed mackerel, and prawns are fed mashed up fish. The problem is that these fish are not caught using sustainable methods, resulting in habitat destruction and severe social / economic impacts on local communities. Especially in developing countries. Yum. Prawns. . . but that flavour may come at a cost. Orissa, India. A costal settlement which mainly relied on subsistence fishing, and very little industry. In steps the World Bank with funding for a prawn farm, which aimed to utilise the saltwater lagoons that are common in that area. Lagoons are populated with various type of prawn / shrimp, and trawlers are dispatched to catch any type of fish / sea creature to mash up and feed to them. Pretty soon fish stocks in the area are seriously depleted, and traditional subsistence fishing starts to become unviable. The farm which employs around 15 people, has now made life difficult for around 500 people in the surrounding area. Tension mounts between villagers and prawn farm workers, resulting in violence, and the deaths of 3 people. 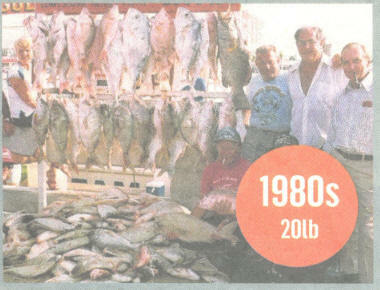 The nature of fishing the UK has changed dramatically and has become far less sustainable. 50 - 60 years ago, as the map to the right shows, there were many small fishing ports in the UK, all using small low tech methods for fishing. Tonnages of fish caught were significant, leading to the conclusion that is was easier to catch fish back then, there were a lot more of them. 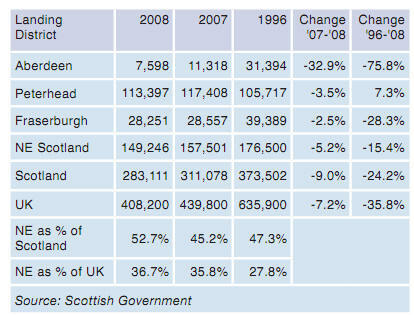 In ports such as Aberdeen (not shown on this map sorry) we have seen a 33% drop in fish landings just since 1996, let alone 1950. The quantities of fish in the oceans are collapsing. And only your shopping habits can change that! Look for fish with sustainability labelling, only may sustainable species of fish, and eat less fish . . they could do with a rest. It is clear that as we become more and more cunning as a species, fish have to up their game in order to escape the fishing nets. The picture to the left shows aberdeen fish market in the 1950s. Look of the size of the those fish. You don't get them like that these days, for the majority of fishh they no longer reach maturity before being caught! Some have even adjusted the size at which they mature. Evidence was supplied by Callum Roberts York University. Original Article was written by Jonathan Leake. Again in Orissa India we find the Astaranga Fishing Port which has a large fishing fleet. Stocks have been declining over the last decade. In the programe we see a trawlers bottom dragging for 1 hours, with a total catch of 5 prawns and about a dustbin full of by catch. Prawns are small so you need a fine mesh, this means everything is caught. A look ecological project was visited that aims to protect sea turtles. According to the project organiser around 10,000 sea turtle are killed around Astaranga every year. Turtles need to breath every 45 minutes, and when trawlers drag there nets around for 1, 2 3 hours the turtles caught in th nets can't get to the surface to breath and die. Large areas of low altitude Bangladesh are easily converted to Salt water lagoons, where prawns can be farmed. Farmers who once grew crops in these highly productive delta areas, have been encouraged in to prawn farming by processing factory owners. The problem is that once you have flooded your land in this way, you can not go back. It is a one shot deal. The ground is salinised and useless for growing crops. 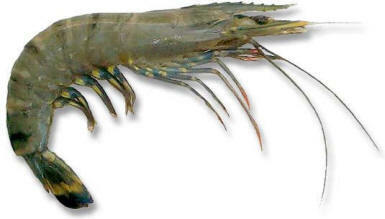 Obviously growing say maize on an acre of land will feed many more people than growing prawns on the same area. This can not be good for a country with a rapidly expanding population, which thanks to the sea food desires of the west is quickly ruining large areas of its most productive farm land.